MACON, GA (May 20, 2016) – CARSTAR Macon has recently gone through a complete transformation and celebrated with a Grand Opening on Friday, May 20. The event featured lunch, door prizes and the presentation of refurbished 2003 Honda CRV to a deserving student from Central Georgia Technical College. The CGTC Foundation facilitated the donation of the car. 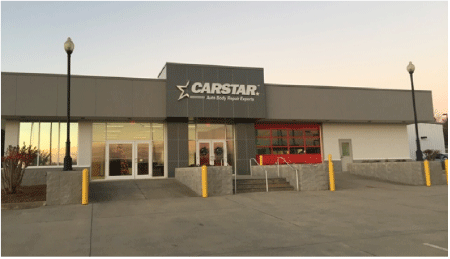 The shop, formally known as CARSTAR Preferred Collision, has relocated from an 8,500 square-foot-facility to a modern 23,000-square-foot building. The new location will be able to better serve customers with features like a drive-in estimating bay, office space to meet with insurance companies, spacious reception area, and larger, up-to-date production area for technicians to perform high-quality repairs. Lee is also the chairman of the local I-CAR committee and plans to utilize the facility’s upstairs office space for meetings and I-CAR training.